BorgWarner is a leading, global automotive manufacturing company focusing on creating a cleaner, energy-efficient world. The Ithaca Plant focuses on manufacturing and innovating automotive chain systems and components for engine timing, automatic transmission and four-wheel drive applications. BorgWarner sells directly to major automotive manufacturers, such as Ford, GM, and Chrysler. About 70% of the vehicles on the road have a product manufactured from the Ithaca plant. The campus has over 1,500 employees and directly reports to corporate headquarters in Michigan. I was placed in the Human Resources Department because there is no communications/marketing department at the Ithaca plant. As a result, I was given the responsibility of in-house designer/marketing specialist. I was an asset to the team that worked on a variety of project throughout different areas on the campus. I gained skills in understanding corporate communications, event planning, marketing, and working with a wide variety of different people. Along with this, I also learned a bit about cars and the chains that go in them - something I had never thought about learning before. Easily my favorite project while interning. From picking the color of the furniture and the tile of the floor, to designing the wall mural and window decals, I took lead on this project to update the main lobby of the BorgWarner Ithaca plant. This is an annual event celebrating those employees who have worked 25+ years at BorgWarner. The event usually has between 200 - 400 guests. I helped plan and run the event, as well as designed the name tags, program, drink tickets, invitations, RSVP cards, and the gift that was given to each person in attendance. I helped increase the recognition of employees safety through designing and implementing the first Recognition Board at BorgWarner Ithaca. Employees can write another employees name on a card and place it on the board - then fill out a star card that employees can display on their desks or cubicles to increase safety throughout daily activities on the plant floor. Quick logos used for various projects on campus including employee runs, groups, tournaments, and jacket embroidery. 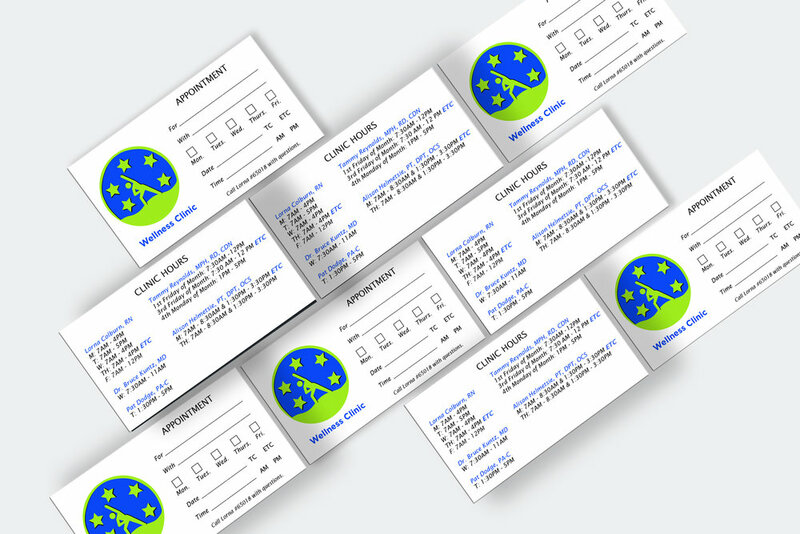 Fact sheets, appointment cards, posters, and stickers.